Reel Vegas Casino will then reward you with a bonus (Welcome Bonus is for new players only). The terms and conditions of the bonuses vary between different casinos and might also change over time and between different countries, so it is important to compare the different offers and read the T&C for Reel Vegas Casino before signing up. 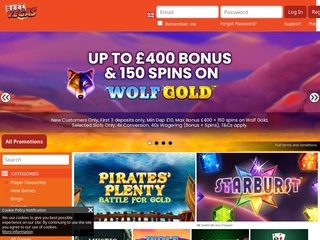 Operated and owned by Nektan Limited Casino, Reel Vegas Casino is a browser play, mobile compatible casino licensed by Malta Gaming Authority, Gibraltar Regulatory Authority and UK Gambling Commission. The casino is available to residents of most European countries, while USA located players or residents of states where gambling is prohibited will not be able to register. The registration process is simple and the potential members will be able to open an account in no more that a few quick steps. If you are struggling with your English, you will be able to change the language settings and switch to Italian, German, Norwegian, Swedish or Finnish. Once inside, newcomers will be greeted by the welcome bonus which extends to the first three deposits – the promotions and other features of interest will not be difficult to spot thanks to the extremely easy to navigate website. If you do get stuck and you are unable to find an information, the support button is located in the right upper corner and you can request to chat to the casino representative at any given moment. Apart from being extremely user-friendly, the site is also very bright and colourful, featuring the latest promotions previews and a sneak peak to the recent and most popular releases by the top notch software developers. Being Nektan owned, Reel Vegas obviously provides the entire Nektan gaming assortment, along with slots, table games, live tables and other releases from more than 20 software developers: NetEnt, NextGen, IGT, Elk, Microgaming, Evolution and many more. The entire list of providers is displayed under the search bar, and you can filter the games by simply ticking the developer you are interested in. Players who are looking for a specific game type can narrow down the search by using the advanced filters, such as New Games, Jackpots, Live Dealer, Instant Win, Exclusive, Casino games or simply visit the Player Favourites and see what other people are recommending. As with a lot of online casinos, Reel Vegas scatters their slot offer according to the release date, progressive jackpot size, payout frequency and ranking. With the number of developers that partner with the casino, you can definitely count on most of the classic and highly rated games being included in the offer. Starburst, Gonzo’s Quest, Flowers, Asgardian Stones and Mega Moolah are all there, along with a number of recently launched video and 3D slots. Most of the games are available in demo play and you can check how smoothly they run even if you are yet to open an account. This is where you will find all of the standard table and card casino games in either live or video version. 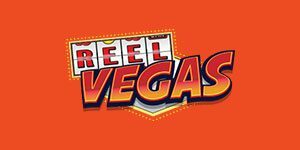 Reel Vegas plays it safe and the offer covers only the absolute basics – Roulette, Punto Banco, Blackjack and Texas Hold’em. The selection of games that do not fall under any of the main categories is modest at best, and a couple of Bingo or Scratch card options can be traced. Player who crave some live table action will be at home under Reel Vegas Live Dealer category, where you will get to play at actual tables hosted by professional dealers and streamed live from Evolution Gaming studios. For those who prefer a more conventional layout, traditional Roulette, Baccarat, Blackjack and Poker tables are included in the offer, with high speed and VIP variants. If you are ready to party, Blackjack Party table and Dream Catcher are also available. One of the great things about Nektan casinos is that you will definitely have plenty of payment options. Reel Vegas accepts PayPal, Visa, Visa Electron, Maestro, MasterCard, Zimpler, Trustly, Skrill, Neteller, Paysafecard and Boku. Submitting a deposit is free, although 15% will be deducted from your payment if you are using Boku – in all other cases, the casino will receive the exact same amount that you transfer over to them. The lower limit for placing a deposit is set at £10 – or £15 for Boku users – with an option of managing your own depositing and withdrawal limits. To withdraw the funds, the member must submit a request and give the casino up to 3 business days to verify the account and approve the request. Members can request one withdrawal per day in the amount of £2,000 and the entire process (excluding the pending time) can take 24 hours if you are using e-wallets or 1 to 3 business days for credit/debit card withdrawals. Reel Vegas Casino representatives can be reached via Live Chat or email. Should you decide to send an email inquiry, you can expect a reply within 24 hours. Live Chat and phone support is limited to the casino staff working hours, which is from 8.00 to 00.00 GMT. The response time from the time you ask your question or dial there number to the moment an agent starts assisting you is usually no more than a couple of minutes (tops) and the representatives are friendly and eager to assist.